Last year for Halloween we styled looks that were perfect to wear to work on Halloween (see Molly's look here and Jodi's here), so this year we're taking a bit of a different approach. 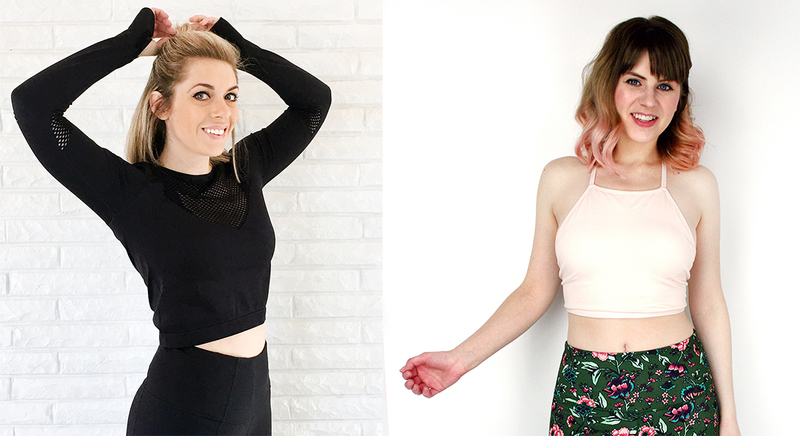 We looked to the runway and high fashion for inspiration, and have come up with some strikingly spooky looks for this month's Wear it Two Ways! I was all about setting the scene for Halloween, so I snapped photos at The Epperson House, a reportedly haunted mansion near where we live. 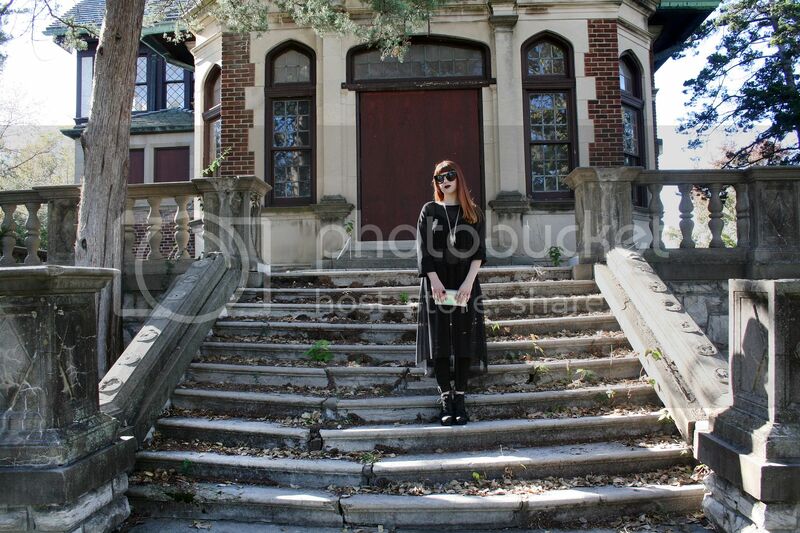 I was half expecting to see ghosts in the photos when I got home, but I dodged a bullet there! Whew. 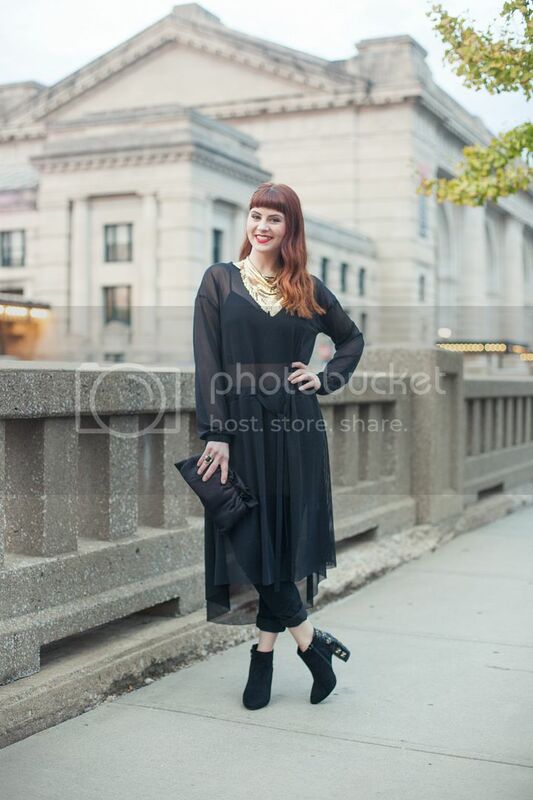 For my haute Halloween look, I knew I wanted to create the look around a sheer black dress. Not only does it have a spooky otherworldly quality about it, but sheer dresses are everywhere on the runway! 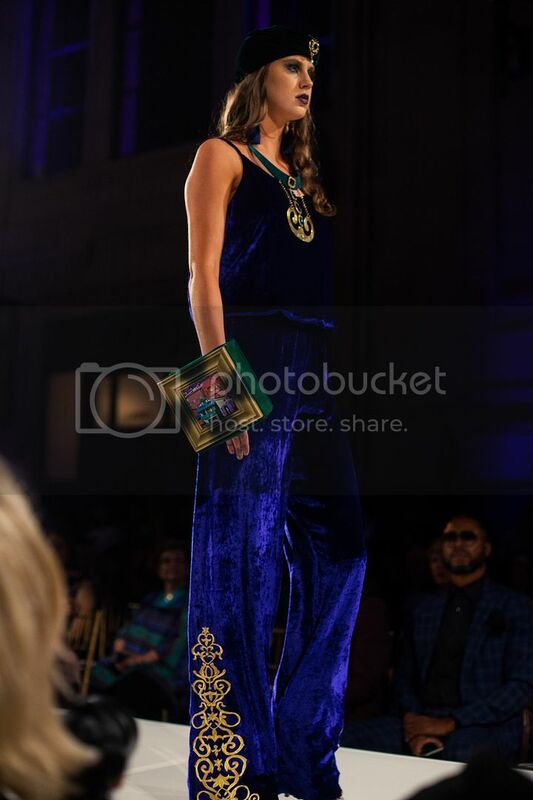 You can see how versatile they can be in my Kansas City Fashion Week recap here. We've also seen pants under dresses a lot in up-and-coming fashion, and this sheer dress is a great way to ease into that trend. 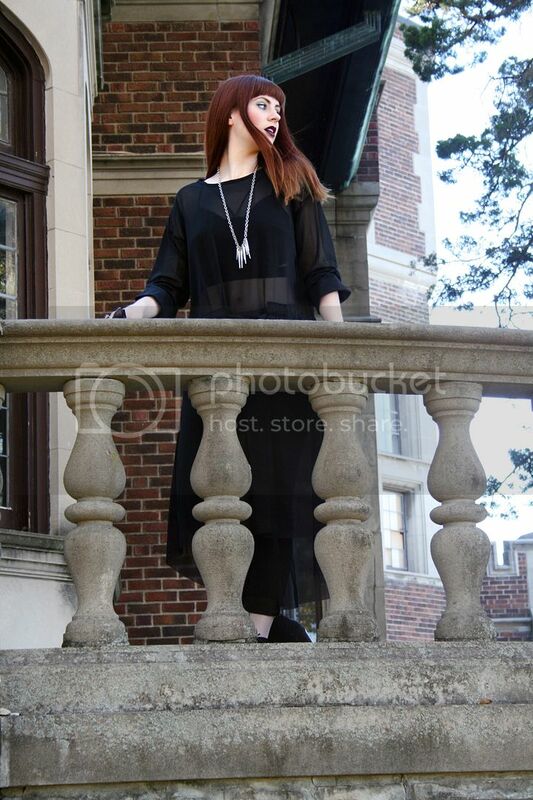 A spike necklace I made with pieces from Hobby Lobby was a perfect spooky element to add to the look. Chunky black booties may have a Frankenstein feel to them, but they're also super trendy right now. These and go-go booties are going to be everywhere this season. For the final touches, I used a super shimmery eyeshadow from H&M for a night-inspired look because, yes, all the glitter I used to pile on in grade school when playing with makeup is back in a big way. Dark blue and bright red ombre lips add a fun and freaky vibe to the look as well. Maybelline currently has a great midnight blue lip color for pretty cheap if you want to try out this fun new trend! It's the blue that both Jodi and I own, because, believe it or not, dark blue lip colors in drugstore brands aren't that easy to come by! My haute Halloween look takes inspiration from a few different sources. First and foremost, feather epaulettes are something I've been dying to try for a couple of years now. I mean, can you really get more high fashion than feather shoulder decorations? They seemed easy enough to recreate, so I made some of my very own this past weekend. I documented the process too, so look for the tutorial on the blog this week! These turned out really great and make a great addition to my blazer cape (aka blape). I've been on the hunt for a wide brim black felt hat ever since I saw American Horror Story: Coven. I hastened my search when I saw Beyonce's Formation video and finally found the perfect one on Amazon! 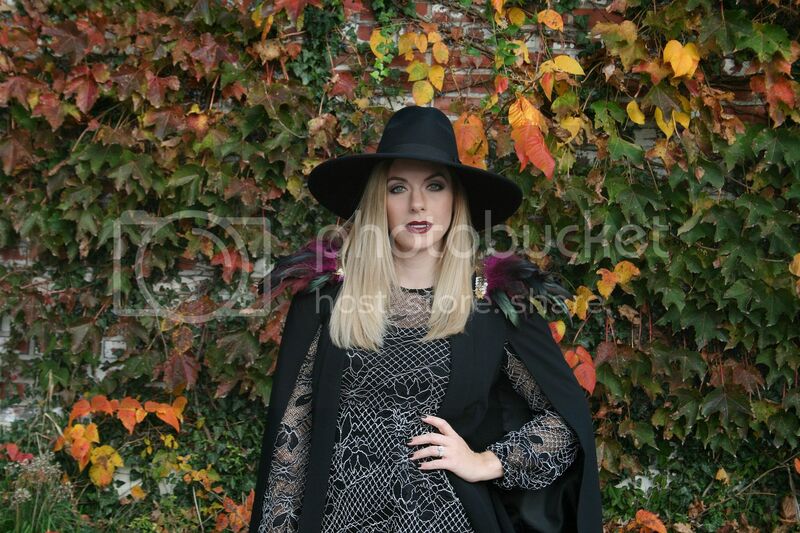 I think it's the perfect modern day witch hat that is perfect for a high fashion Halloween look. It says, I'm a witch, but I also care about the latest runway trends. My accessories are so loud and proud, that you almost don't even notice the rest of my outfit! Lace is everywhere now because gothic glam is huge for fall. I absolutely love this lace dress from Zara. It's the perfect mix of edgy and classic. 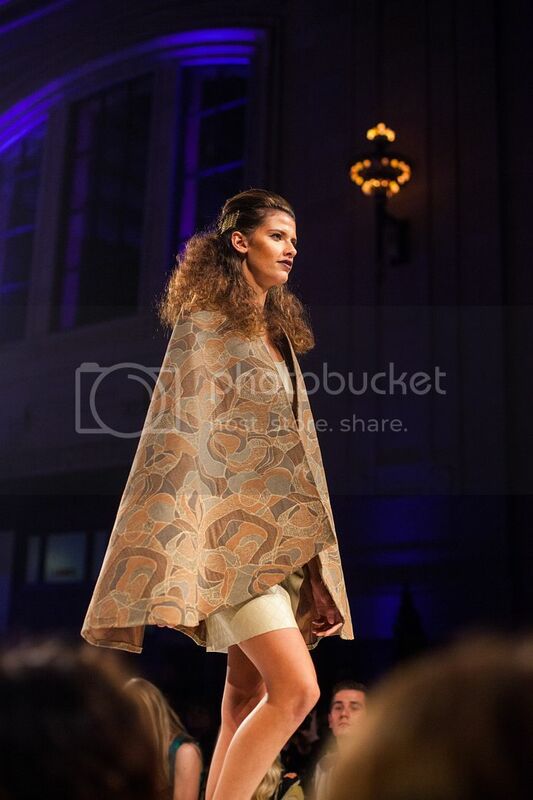 Plus, it also makes a great neutral if you want your accessories to do the talking for the evening. Of course, I kept my makeup dark and brooding to really play up the theme. I kinda dig it though, so I think I will have it on repeat through the rest of the fall and winter. Now, if only I could wear these epaulettes everyday, I'd be set! I've been obnoxiously dressing up for Halloween all week at work (if you follow us on Instagram you've probably seen already), and this is the ridiculously themed crown jewel of this week's collection. It's part Victorian lady, part ruffly '80s, part costume, part regular outfit, and all Halloween. I wanted to go for a spooky backdrop, so we headed to the Nelson-Atkins Museum of Art to get some shots in front of a silver sculpture that looks like a creepy futuristic tree. Unfortunately, the bright sunlight wasn't the most conducive to taking good photos, but we did get one that shows the whole 56 ft. sculpture! For my ultra-Halloweeny look, I thought this orange ruffled top would be perfect. Especially since I don't wear a ton of orange, it really stands out when I do wear it, and this is the week to do that, folks! 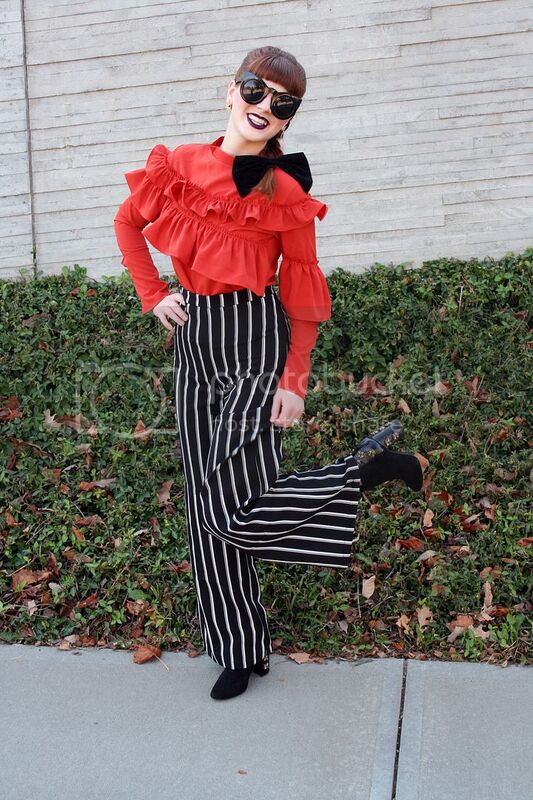 Black and white striped pants reminiscent of Beetlejuice or Jack Skellington kicked my orange and black color scheme up a notch. Cat-ear (I mean they're different than cateye, so I'm going with ear) sunglasses, bejeweled booties, and a giant velvet bow make for elegantly spooky additions to the ensemble. They also ensure there isn't a part of this look that isn't a statement piece. For more Halloween inspiration, take a look at my Halloween look from last year and Jodi's look from last year. All of these are great examples of how you could dress up for the holiday this weekend or on Monday without being in costume! I really love a good nautical theme. Give me an anchor on a button and I am one happy camper. 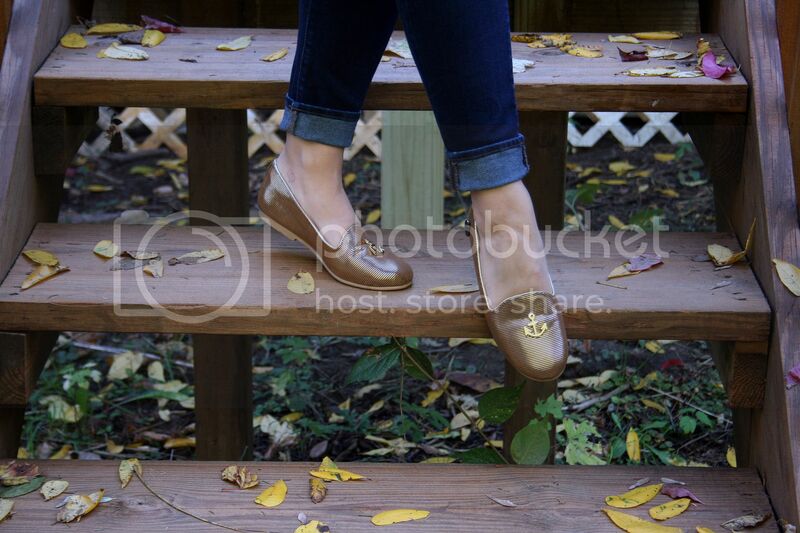 So, when I saw these golden anchor loafers from Loly in the Sky, I was smitten! 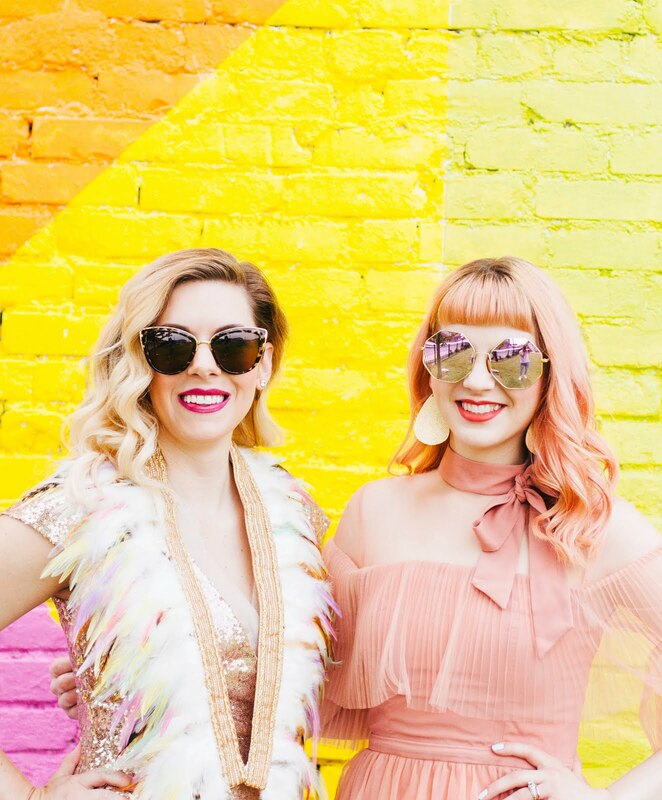 We really dig Loly in the Sky, so when they reached out to us and wanted to collaborate on a couple of blog posts, it was a no brainer for us! 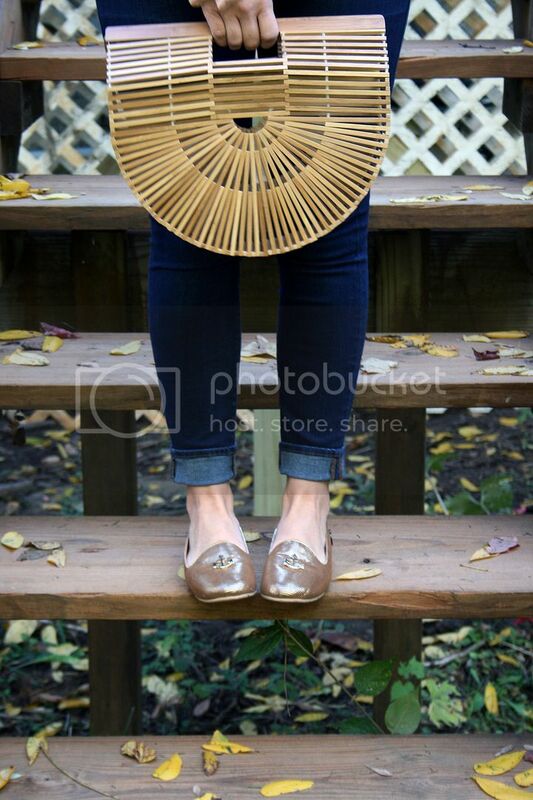 We're familiar with Loly in the Sky because Modcloth has carried them for a while. Additionally, they have recently been chosen as a graduate of "The Workshop" at Macy's which mentors and fosters growth within up-and-coming minority and women owned businesses, which is definitely a program we can get behind. We are firm believers in developing women, especially in the business world. As part of being a graduate of this program, Loly in the Sky is now available at Macy's, which means you can go to your local store to pick up your very own pair! As I said above, I love a good nautical theme. 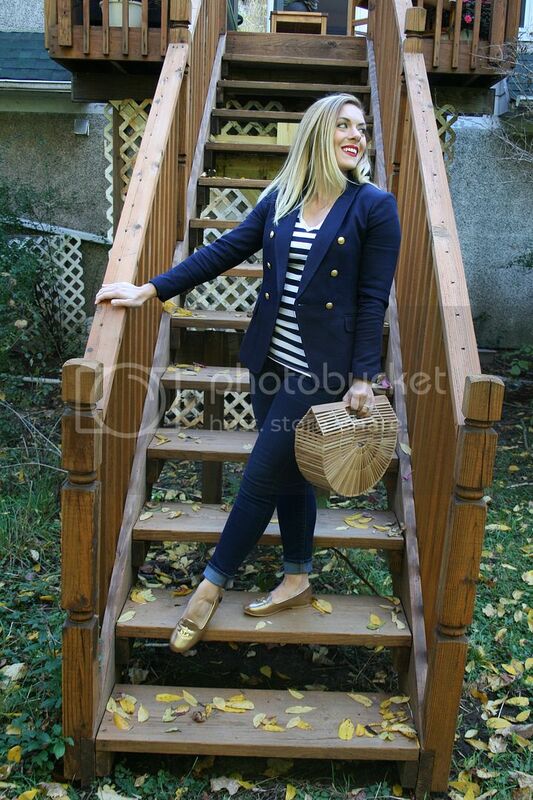 Naturally, I carried the nautical theme of these loafers into the rest of my outfit. I'm really digging a sailor blazer and striped shirt combo lately. It basically screams, "Take me to your yacht!" 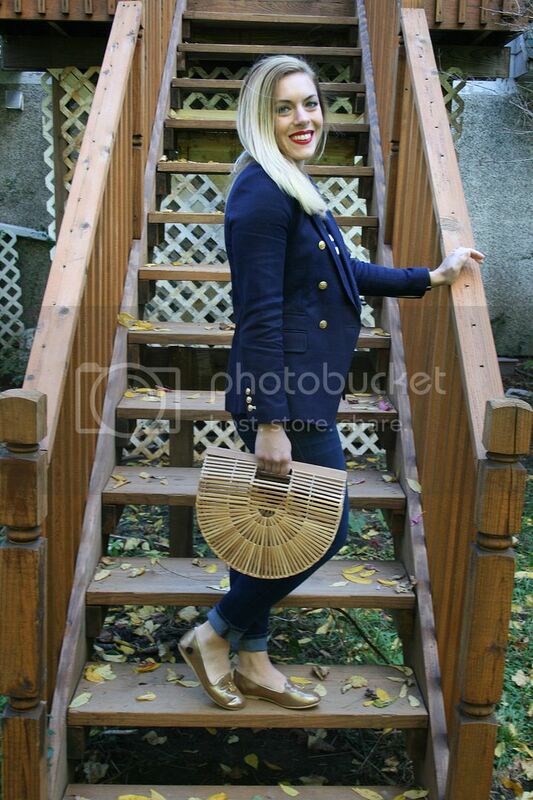 I'm also OB-SESSED with this vintage inspired Japanese picnic basket bag. It literally goes with everything and is so unique! Throw on a red lip and you're basically ready to charter your own cruise line! If you haven't checked out Loly in the Sky, visit their website to learn more about this amazing business. You can watch the process for how the shoes are made here. Also, be sure to check them out in a Macy's near you or online now! 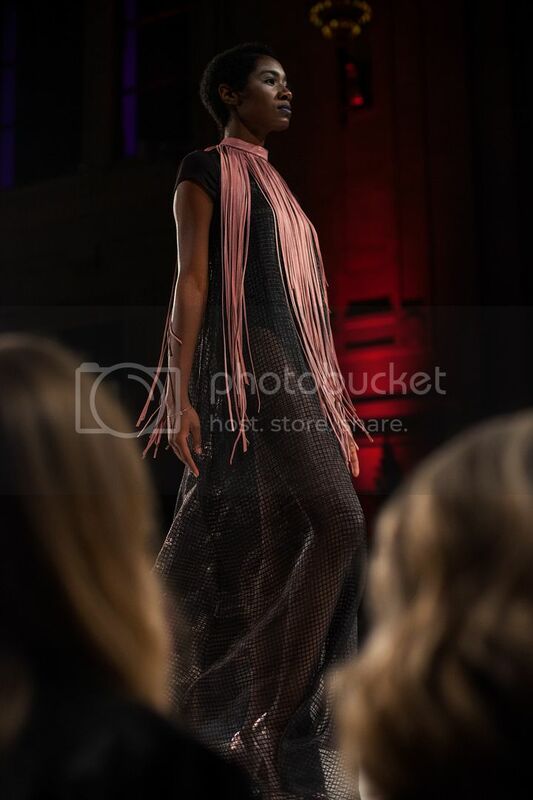 If you follow us on Instagram (or Facebook or Twitter), you probably already know that I attended Kansas City Fashion Week a couple of weeks ago, because you were barraged with photos and Instagram stories showing fun bits and pieces. Here, I've rounded up the whole experience, so you can get a good overview of how it went down. 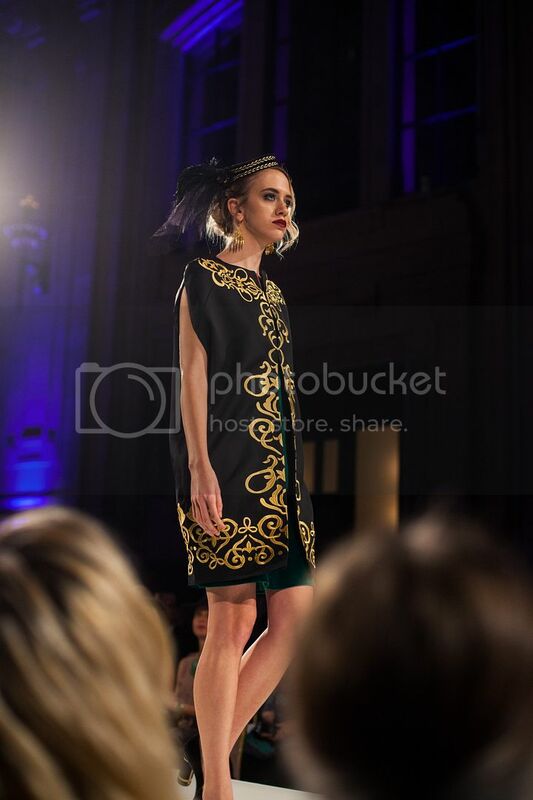 KCFW kicked off with networking and shopping events earlier in the week before the runway fun began. 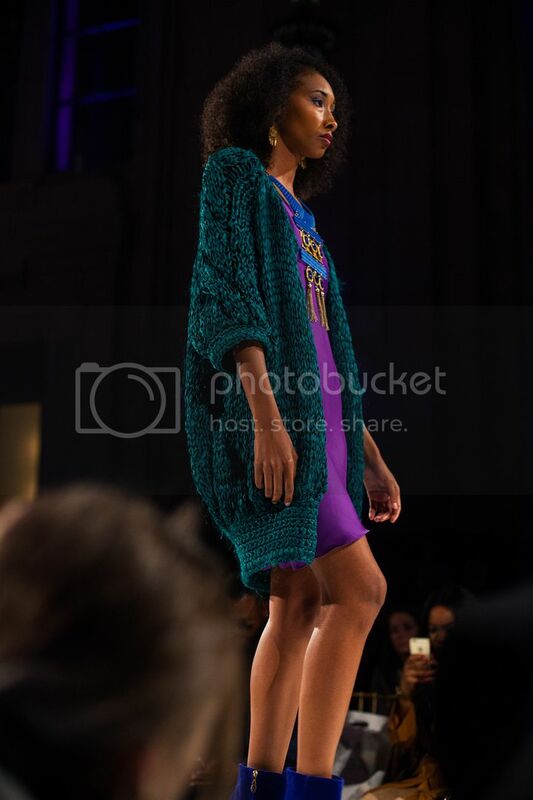 The event I was able to attend was the style and shopping event at Anaphora and Post/Edit. It was part shopping, part cocktails and mingling. 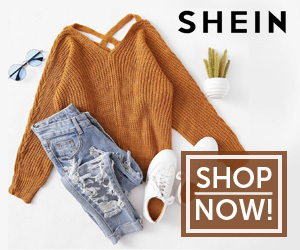 I met some wonderfully fashionable and and friendly bloggers and was able to snag some super reasonably priced jewelry from Post/Edit to wear throughout the rest of the week. I styled this floral dress above from Zara for a comfortable yet polished look. 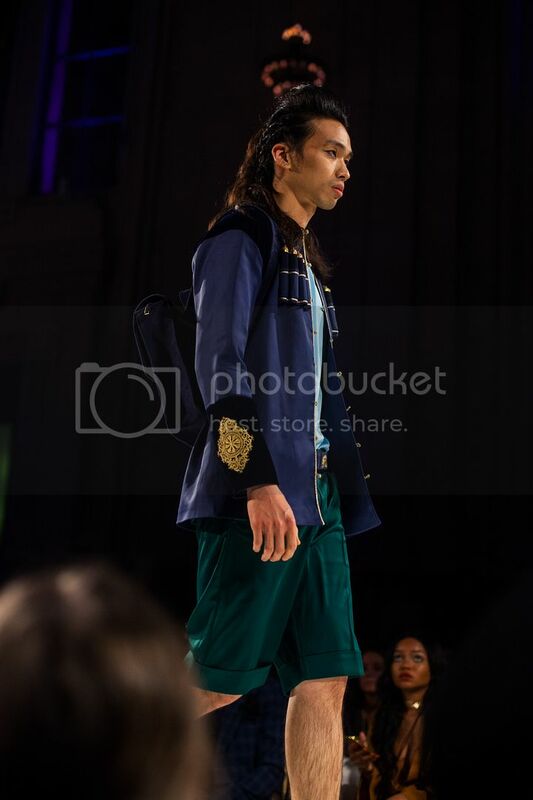 After that, I was onto the runway shows! 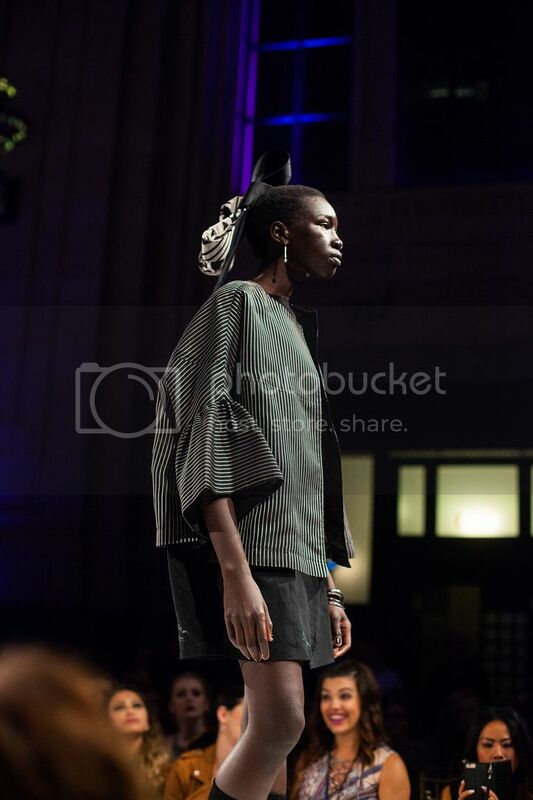 I attended three shows, located at Union Station, Thursday through Saturday. My first outfit was a sheer black dress, also from Zara. I was super excited to see at least a couple very similar looks on the actual runway. A huge shoutout to my friend and photographer-for-the-week Chris Yankey for attending the shows with me and getting some amazing shots. 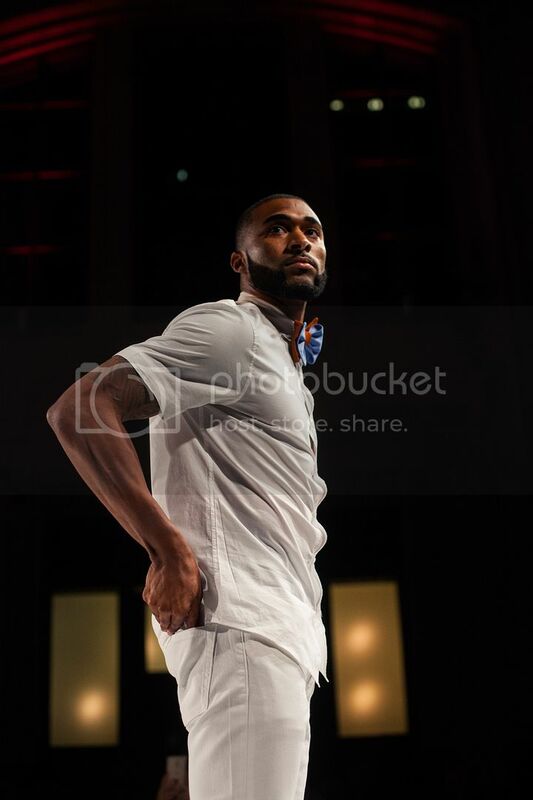 Standouts from Thursday included Keefe Cravat, a local bowtie business (pictured above), Roger Figueroa and his dramatic pieces for both men and women (pictured below), Barbara Bultman and her amazing use of fringe (two below) and Kiana Godsey, a local designer with featuring lots of interesting shapes (blush jacket below). 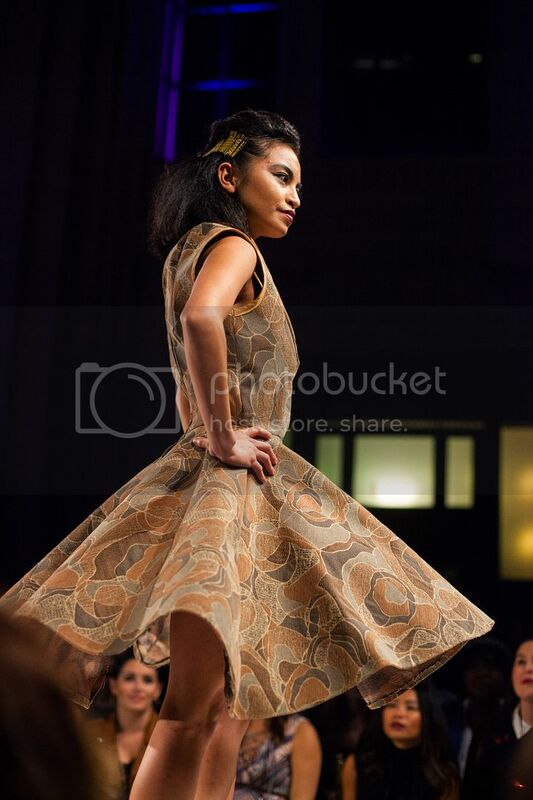 On Friday, some of my favorite looks included retro-inspired materials and cuts from RBW Designs (three photos below) and gorgeous dramatic structured pieces from Asiatica Kansas City. 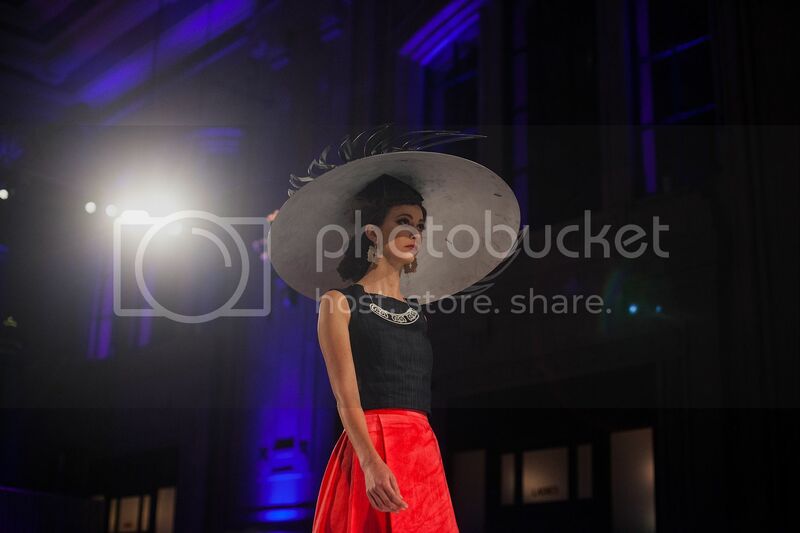 Saturday was the largest event, featuring the most designers, and was also the cap on all the events for the week. 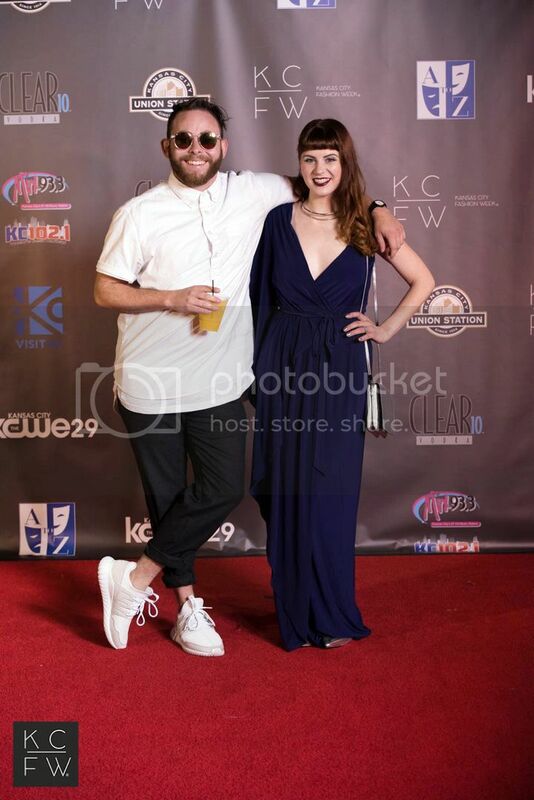 I saved my asymmetric evening gown for that night because I knew if I was going to get fancy, this was the night. I paired it with all silver accessories, going for a chic almost space-inspired vibe. 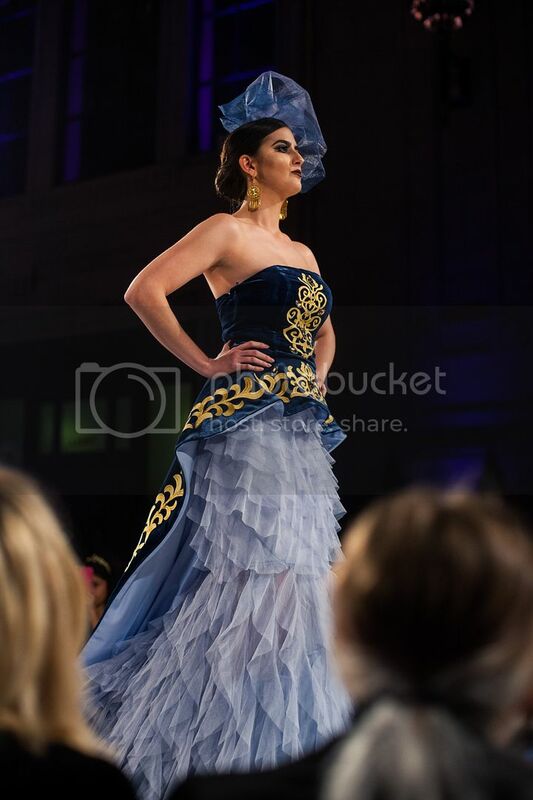 Some of my favorite looks from the evening came from the sixteen year old designer of LaRae Designs (photo below), and Atelie Samosi, a designer from the country of Georgia, featuring gorgeous velvets and embroidery (next six photos below). Sheer dresses weren't limited to black! 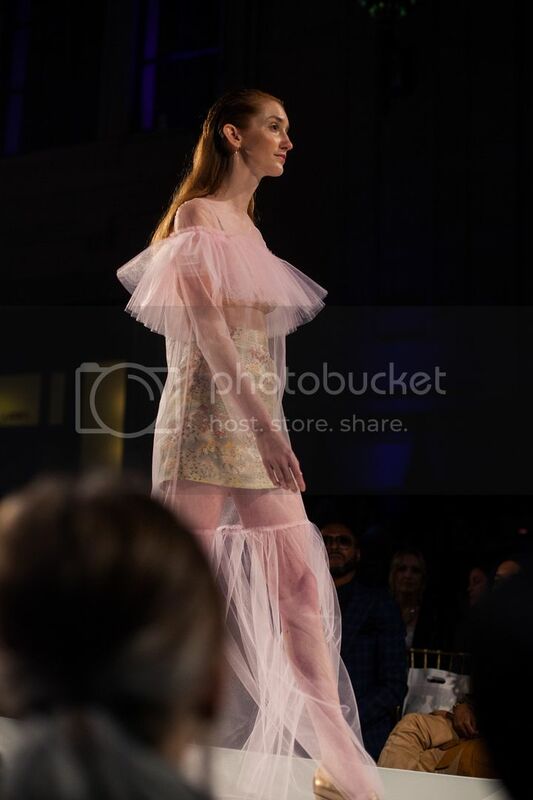 This whimsical look was also showcased in Lucia's Sarto couture bridal line (below), and ultra fun and playful pieces from Julia Fischer. 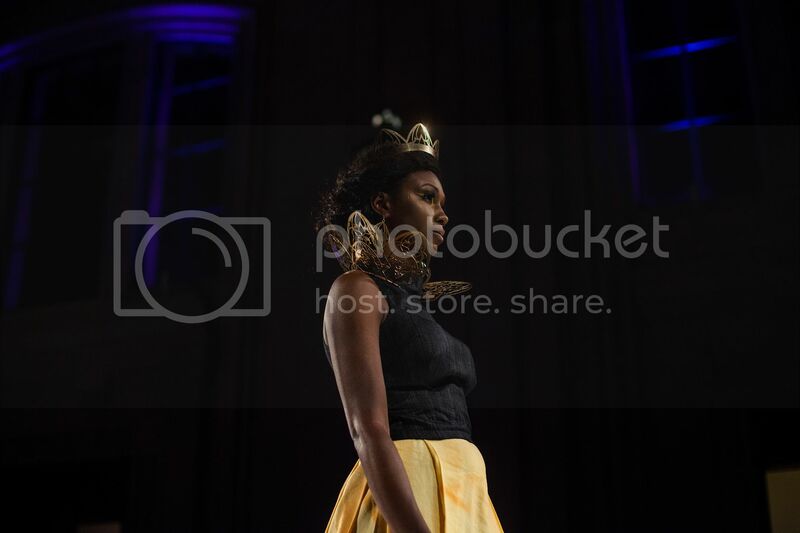 Jewelry including collars, crowns and even hats by AnnMann Designs were real show stoppers that were a perfect mix of playing dress up and looking next-level elegant. 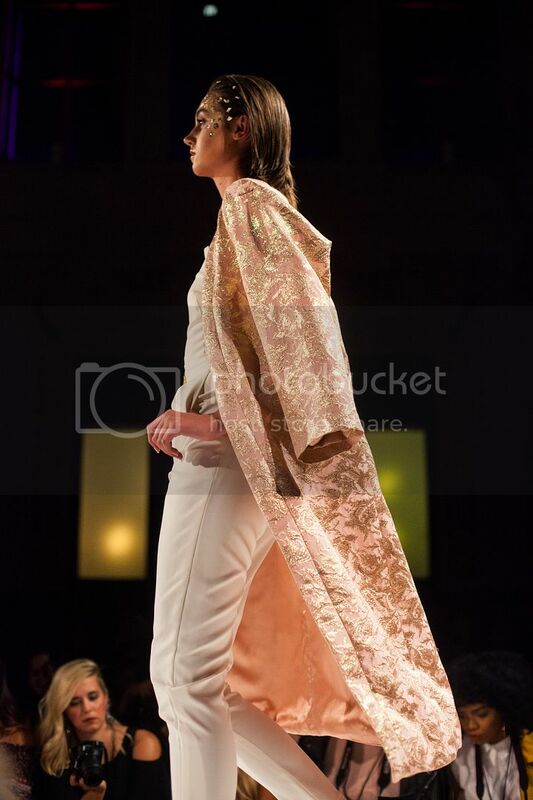 Overall, the trends I was drawn to most were sheer material, structured capes, and textures like silk, satin, and velvet making a statement. 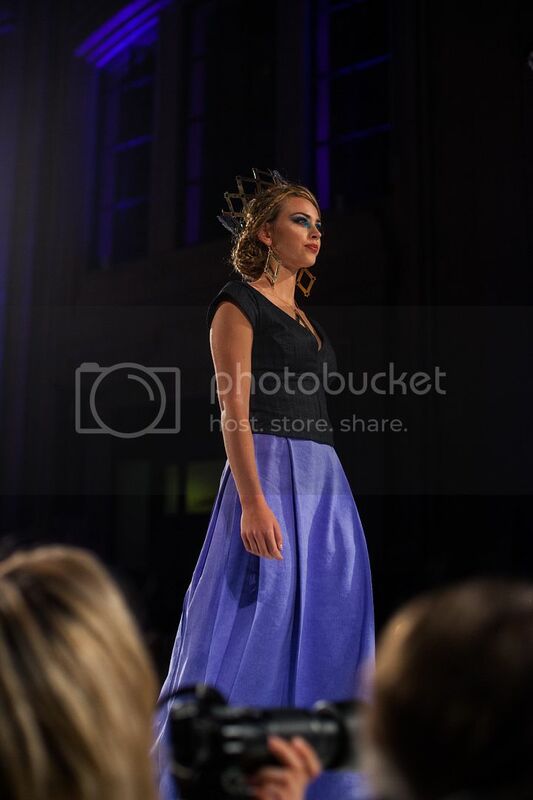 Thanks so much to Kansas City Fashion Week, LLC for letting me attend with a media pass and get inspired for Spring! 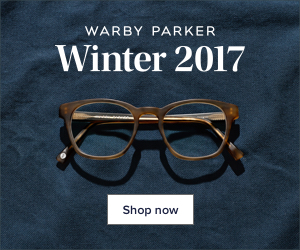 I already can't wait to check out next year's Fall/Winter Collections!